The B&G Zeus³ Glass Helm 24 is designed specifically for blue water sailing, multihulls and superyachts. This premium, super-fast, large-screen, multifunction display sits at the heart of your fully integrated navigation system. The Zeus³ Glass Helm provides easy-to-use touchscreen and remote control options. B&G’s unique sailing features including SailSteer and RacePanel all combine with Radar, charting, sonar and much more. Zeus³ Glass Helm 24" System Pack. Includes Zeus³ 24" Multifunction display, MI10 card reader and ZC2 controller: The B&G Zeus³ Glass Helm is designed specifically for blue water sailing, multihulls and superyachts. This premium, super-fast, large-screen, multifunction display sits at the heart of your fully integrated navigation system. The Zeus³ Glass Helm provides easy-to-use touchscreen and remote control options. 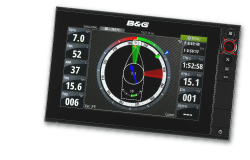 B&G’s unique sailing features including SailSteer and RacePanel all combine with Radar, charting, sonar and much more.